KUALA LUMPUR, May 27 — Vivian Lee May Ling was today sentenced to six months in prison after she was convicted of sedition over a mock greeting featuring the “bak kut teh” pork dish during the Muslim fasting month. Sessions Court judge Abdul Rashid Daud said the matter involved the sensitivities of the Muslim community, and that he was imposing the prison term to deter others from doing the same. “You know that pork is haram (forbidden) for Muslims. “Like what the prosecutor said, nasi sudah jadi bubur, even if there was apology, but your actions have injured the feelings of Malaysians,” he said, using the Malay idiom that means “too late to make reparations”. The judge said the six-month jail term, less the eight days Lee spent in lock-up from July 18 to July 25, 2013, was meted out as this was her first offence. First-time convictions for sedition are punishable with a maximum RM5,000 fine or a maximum three-year jail term or both. Immediately after the conviction today, lead counsel Chong Joo Tian sought a good behaviour bond for Lee, noting that the 27-year-old customer support services representative has no criminal record and had started a new life without the ex-boyfriend who was jointly accused over the same mock greeting on Facebook. Chong also highlighted that she was not the main offender and merely played a passive role over the July 11, 2013 Facebook photo, adding that she had apologised on Facebook and removed the greeting the same day as well as apologised in a YouTube video the next day. “This shows the accused’s regret in this case. Even though in this case there was evidence of public anger towards the posting, but the evidence shows there was no chaos at all or fights between races or people of different religions,” he argued. Chong also pointed out that his client had not acted violently or caused physical injury to others, arguing that this was merely a case over an abuse of the constitutional right of freedom of expression and the wrong use of words. But deputy public prosecutor Wan Shaharuddin Wan Ladin pressed for a jail sentence of between 20 and 24 months, arguing that there was a need for a “chilling effect” to deter other would-be offenders from mocking the religious beliefs of others in Malaysia. Wan Shaharuddin cited public interest and argued that Lee’s actions had injured the feelings of both Muslims and non-Muslims in Malaysia, noting that online comments from many in the Chinese community showed they were upset as well. “All Malaysians have the responsibility to respect the race and religion of others because it is appropriate social behaviour. It is not the prosecution’s intention to restrict Malaysians in the use of social media or Internet but there needs to be a standard to control an individual to be more responsible when uploading anything on social media,” he said. He also said the offence was serious and argued the sentencing trend in the Malaysian courts was to impose imprisonment for sedition convictions, citing among others Sabah politician David Orok’s 18-month jail term after he pleaded guilty to a seditious insult of Prophet Muhammad. “The court will be considered to have failed if it imposed a sentence based on compassion and sympathy on the accused,” he had argued. After the sentencing, Abdul Rashid allowed the jail sentence to be stayed pending Lee’s appeal to the High Court, but increased the bail from RM10,000 to RM20,000 and ruled that her passport remain in the court’s possession. Wan Shaharuddin told reporters later that he will also file an appeal to seek for a harsher sentence to be imposed. The picture of Lee together with then boyfriend Alvin Tan Jye Yee, which was posted on Facebook on July 11, 2013 during the Muslim fasting month then, carried the words “Selamat Berbuka Puasa (with Bak Kut Teh...fragrant, delicious and appetising)” and the halal logo. 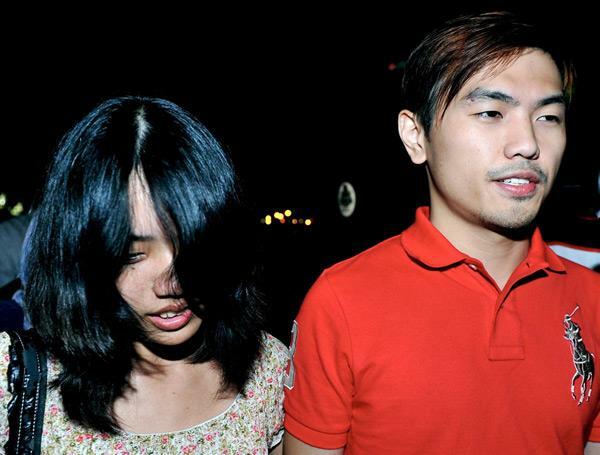 On July 18, 2013, Tan and Lee were charged under three laws: Section 5(1) of the Film Censorship Act, Section 4(1)(centre) of the Sedition Act and Section 298A(1) of the Penal Code. But the Sessions Court had on April 14 acquitted Lee over the display of pornographic images on the duo’s now-defunct blog between July 6 and 7, 2013, while Tan — who did not attend trial — was given a discharge not amounting to acquittal. The Court of Appeal had previously dropped the charge of Section 298A(1) against the duo as it ruled the legal provision did not apply to non-Muslims. Under the Section 298A(1) charge, the duo were accused of uploading content that could possibly stir hostility among those with different beliefs between July 11 and 12. Tan jumped bail and is believed to have fled to the United States to avoid facing trial.